The Recital will be TUESDAY, June 6 th , 2017. The doors will open at 4:30pm and the performances will begin at 5:00. Performers should arrive no later than 4:30pm. Please plan to stay for the entire recital; we will be taking photos after. WHERE WILL THE RECITAL BE HELD? WHY PARTICIPATE IN THE RECITAL? A recital for a musician is a chance to perform for an audience! Participants work hard in preparation and the experience is memorable and rewarding! In keeping with the teaching philosophy at Samara Rice Music, performance material is taught to the students in a positive, age-appropriate manner. This is a non-competitive process and our performers will gain confidence and take pride in performing for an appreciative audience. Although there are no specific requirements, looking your best is recommended! Consistent lesson attendance and at-home practice is very important for recital preparation. Please make sure that your performer attends lessons and practices regularly to prepare for a successful and positive experience! The recital fee of $10 is due with the permission slip. Permission slips are due by May 12 th, 2017. Thank you for your support! 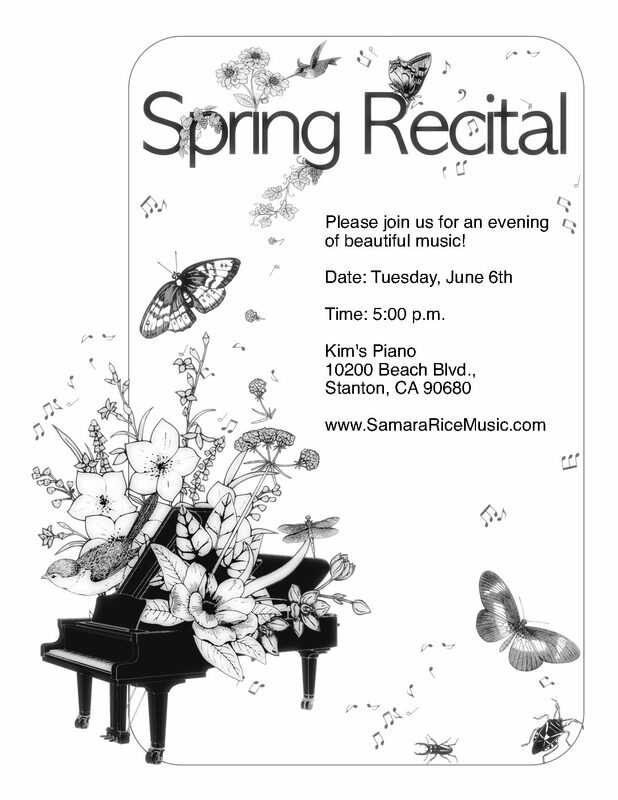 Looking forward to another wonderful recital! Samara Rice Music provides high quality play-based piano music lessons for kids and teens in Huntington Beach, CA 92649.